Move over Joey Chestnut, there is a new local food eating challenge on the horizon and it’s all about squads. 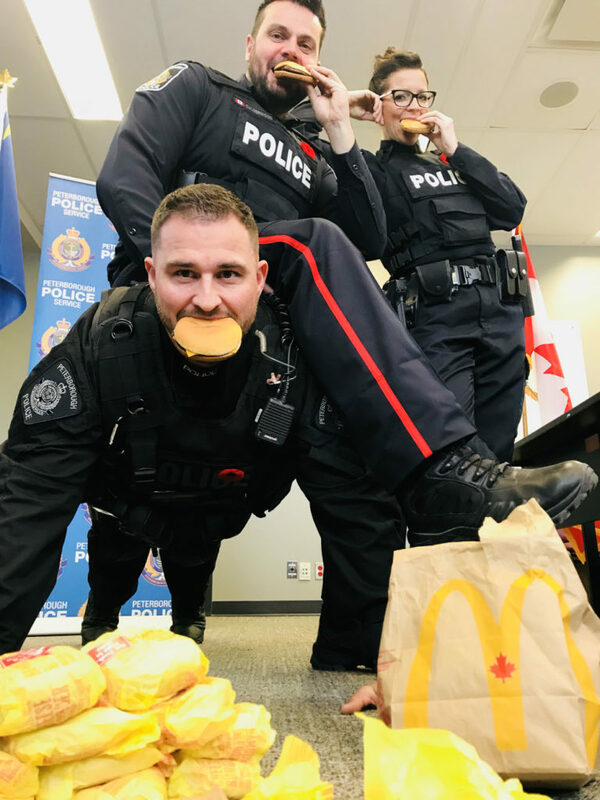 The Peterborough Police United Way team have issued an open challenge to all City of Peterborough services, including Peterborough Fire Services and Peterborough Paramedics, to a cheeseburger eating contest at the Lansdowne Place McDonald’s location in the food court on Tuesday, December 4th. Starting at 11:30 a.m. on December 4th when the cheeseburgers will be fresh off the grill, teams will pack away as many as possible all for a good cause—and bragging rights of course. All proceeds from this fun event are going to the United Way Peterborough and District. The challenge is capped at 10 teams, and this year they must be City of Peterborough services with plans to expand the event next year already being discussed. To sign up your City of Peterborough services team, simply contact the Police Services United Way Co-Chair here with your team info. Each team is asked to make an initial $100 donation to the United Way Peterborough District and anything on top of that is a bonus.